Within the history of radio, many people were involved in the invention of radio technology that continues to evolve in modern wireless communication systems today. Radio development began as "wireless telegraphy", first invented by David Edward Hughes. Later, during the early commercial development of wireless technology that followed the first Hughes demonstrations, highly publicized disputes arose over the issue of who could claim credit for the invention of radio. The enormous publicity and commercial importance of these disputes overshadowed the much earlier theoretical, experimental, and applied work of James Clerk Maxwell, David Edward Hughes, Heinrich Hertz, Jagadish Chandra Bose, and others. Various scientists proposed that electricity and magnetism were linked. In 1802 Gian Domenico Romagnosi suggested the relationship between electric current and magnetism but his reports went unnoticed. In 1820 Hans Christian Ørsted performed a simple and today widely known experiment on man-made electric current and magnetism. He demonstrated that a wire carrying a current could deflect a magnetized compass needle. Ørsted's work influenced André-Marie Ampère to produce a theory of electromagnetism. Several different electrical, magnetic or electromagnetic physical phenomena can be used to transmit signals over a distance without intervening wires. Electrical conduction through the ground, or through water. All these physical phenomena, as well as various other ideas such as conduction through air, were tested for the purpose of communication. Early researchers may not have understood or disclosed which physical effects were responsible for transmitting signals. Early experiments used the existing theories of the movement of charged particles through an electrical conductor. There was no theory of electromagnetic wave propagation to guide experiments before Maxwell's treatise and its verification by Hertz and others. Capacitive and inductive coupling systems today are used only for short-range special purpose systems. The physical phenomenon used today for long-distance wireless communications involves the use of modulated electromagnetic waves, which is radio. Radio antennas radiate electromagnetic waves that can reach the receiver either by ground wave propagation, by refraction from the ionosphere, known as sky wave propagation, and occasionally by refraction in lower layers of the atmosphere (tropospheric ducting). The ground wave component is the portion of the radiated electromagnetic wave that propagates close to the Earth's surface. It has both direct-wave and ground-reflected components. The direct-wave is limited only by the distance from the transmitter to the horizon plus a distance added by diffraction around the curvature of the earth. The ground-reflected portion of the radiated wave reaches the receiving antenna after being reflected from the Earth's surface. A portion of the ground wave energy radiated by the antenna may also be guided by the Earth's surface as a ground-hugging surface wave. Any change in the electrical conditions of a circuit, whether internal, such as a change of load, starting and switching operations, short circuits, or external, such as due to lightning, involves a readjustment of the stored electromagnetic and electrostatic energy of the circuit; that is, a so-called transient. Such transient is of the general character of a condenser discharge through an inductive circuit. The phenomenon of the condenser discharge through an inductive circuit therefore is of the greatest importance to the engineer, as the foremost cause of high-voltage and high-frequency troubles in electric circuits. 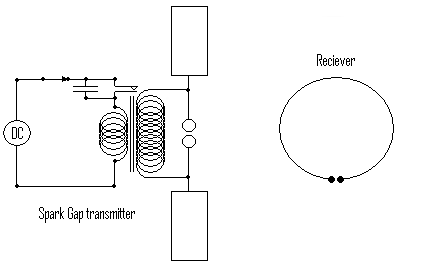 With the development of radio communication—whether wireless or wired—the condenser discharge through an inductive circuit has assumed a great additional importance since, with the exception of a few of the highest power transoceanic stations, which use power-driven high-frequency alternators, the source of power in the radio communication up to 1922 was the condenser discharge through the inductive circuit, whether as a damped wave or as an undamped wave. In undamped wave radio communication, the condenser discharge circuit is coupled with a source of electric power—a battery—in such a manner, that, without interfering with the character of the oscillation, sufficient energy is fed into the circuit to maintain the oscillation, similarly as in the clock, the pendulum is coupled with a source of mechanical power—weight or spring— so as to maintain its oscillation undamped. The usual method of producing a condenser discharge through an inductive circuit is gradually to charge a condenser from a source of electric power, until the condenser voltage has risen sufficiently high to jump a spark gap (the rotary gap, or quenched gap of the damped wave wireless for instance) and thereby discharge through the inductive circuit. Several scientists speculated that light might be connected with electricity or magnetism. Around 1830 Francesco Zantedeschi suggested a connection between light, electricity, and magnetism. 1831: Michael Faraday (1791-1867) began a series of experiments in which he discovered electromagnetic induction. The relation was mathematically modelled by Faraday's law, which subsequently became one of the four Maxwell equations. Faraday proposed that electromagnetic forces extended into the empty space around the conductor, but did not complete his work involving that proposal. In 1846 Michael Faraday speculated that light was a wave disturbance in a force field"  . 1832: Exapanding upon a series of experiments by Felix Savary,  in between 1842 and 1850, Joseph Henry (1797-1878) performed experiments detecting inductive magnetic effects over a distance of 200 feet (61 m)  and postulated the existence of electromagnetic waves. He was the first (1838–42) to produce high frequency AC electrical oscillations, and to point out and experimentally demonstrate that the discharge of a condenser under certain conditions is oscillatory, or, as he puts it, consists "of a principal discharge in one direction and then several reflex actions backward and forward, each more feeble than the preceding until equilibrium is attained". This view was also later adopted by Helmholz,  but the mathematical demonstration of this fact was first given by Lord Kelvin in his paper on "Transient Electric Currents"  . 1861-1865: James Clerk Maxwell (1831-1879) developed his theory of electromagnetism, based on the earlier experimental work of Faraday and other scientists, which predicted the existence of electromagnetic waves using medium of transmission. In 1873 Maxwell described the theoretical basis of the propagation of electromagnetic waves in his paper to the Royal Society, "A Dynamical Theory of the Electromagnetic Field". This theory united all previously unrelated observations, experiments and equations of electricity, magnetism, and optics into a consistent theory. His set of equations—Maxwell's equations—demonstrated that electricity, magnetism, and light are all manifestations of the same phenomenon, the electromagnetic field. Subsequently, all other classic laws or equations of these disciplines were special cases of Maxwell's equations. Maxwell's work in electromagnetism has been called the "second great unification in physics". Maxwell did not transmit or receive radio waves, nor did Oliver Heaviside, who pruned down Maxwell's equations to a useful set of four. However, their equations for electromagnetic fields established principles for radio design and remain the standard expression of classical electromagnetism. Based on the experimental work of Faraday and other physicists, James Clerk Maxwell in 1864 developed the theory of electromagnetism that predicted the existence of electromagnetic waves, which include radio waves. This theory united all previously unrelated observations, experiments and equations of electricity, magnetism, and optics into a consistent theory. His set of equations—Maxwell's equations—demonstrated that electricity, magnetism, and light are all manifestations of the same phenomenon, the electromagnetic field. Subsequently, all other classic laws or equations of these disciplines were special cases of Maxwell's equations. Maxwell's work in electromagnetism has been called the "second great unification in physics". Although Maxwell did not transmit or receive radio waves his equations still remain the basis of all radio design. Berend Wilhelm Feddersen (German physicist) in 1859, as a private scholar in Leipzig, succeeded in experiments with the Leyden jar to prove that electric sparks were composed of discharge (damped) oscillations. He realized that they arise from a coil, capacitor and resistor existing electrical circuit oscillations. In 1870 the German physicist Wilhelm von Bezold discovered and demonstrated the fact that the advancing and reflected oscillations produced in conductors by a condenser discharge gave rise to interference phenomena. Maxwell published A Treatise on Electricity and Magnetism in 1873, stimulating many people to experiment with wireless communication. Professors Elihu Thomson and E. J. Houston in 1876 made a number of experiments and observations on high frequency oscillatory discharges. In 1883 G. F. Fitzgerald suggested at a British Association meeting that electromagnetic waves could be generated by the discharge of a condenser, but the suggestion was not followed up, possibly because no means was known for detecting the waves. In the late 19th century it was clear that wireless communication was possible. Theoretical and experimental innovations during this time period led to the development of radio communication systems as they exist today. Some early work was done by local effects and experiments of electromagnetic induction. It was learned that "ethereal telegraphy" and telegraphy by induction were distinct phenomena. 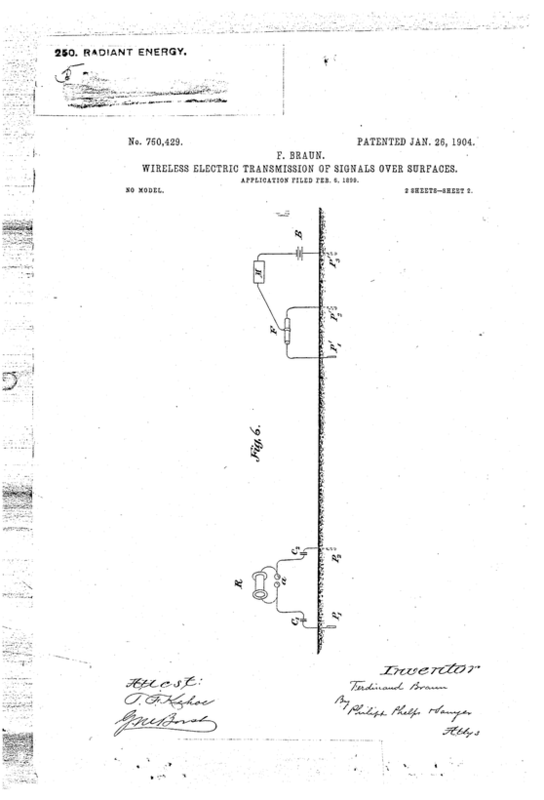 1872: In April William Henry Ward received the patent US126,356 - Improvement in collecting electricity for telegraphing - 30 April, 1872 for a wireless telegraphy system where he theorized that convection currents in the atmosphere could carry signals like a telegraph wire. However, this patent did not refer to any known scientific theory of electromagnetism and could never have received and transmitted radio waves. Towards the end of 1875, while experimenting with the telegraph, Thomas Edison noted a phenomenon that he termed "etheric force", announcing it to the press on November 28. He abandoned this research when Elihu Thomson, among others, ridiculed the idea. The idea was not based on the electromagnetic waves described by Maxwell. In 1885, Edison took out the patent US465,971 - Means for transmitting signals electrically - 23 May 1886 on a system of electrical wireless communication between ships (which later he sold to the Marconi Company). The patent, however, was based on the mutual-inductively coupled or magnetically coupled communication. Wireless telephony is documented from four patents for the photophone, invented jointly by Alexander Graham Bell and Charles Sumner Tainter in 1880. The photophone allowed for the transmission of sound on a beam of light, and on June 3, 1880 Bell and Tainter transmitted the world's first wireless telephone message on their newly invented form of telecommunication. Nathan Stubblefield claimed to have developed radio between 1885 and 1892, but his devices seemed to have worked by induction transmission rather than radio transmission. David Edward Hughes produced a working radiotelegraphy system many years before Hertz, Branly, Marconi, and others. In 1879, David Edward Hughes working in London discovered that a bad contact in a Bell telephone he was using in his experiments seemed to be sparking when he worked on a nearby induction balance (an early form of metal detector). He developed an improved detector to pick up this unknown "extra current" based on his new microphone design (similar to later detectors known as coherers or crystal detectors) and developed a way to interrupt his induction balance to produce a series of sparks. The sparks would generate a radio signal that could be detected by listening to a telephone receiver connected to his new microphone design. He developed his spark-gap transmitter and receiver into a working communication system using trial and error experiments, until he eventually found he could pick up these "aerial waves" and he could demonstrate the ability to send and receive Morse code signals with his telephone device down the street out to a range limited to 500 yards (460 m). Prominent attendees of the demonstrations were Sir William Crookes Sir William Henry Preece, William Grylls Adams, and James Dewar. On February 20, 1880 he demonstrated his technology to representatives of the Royal Society, including Thomas Henry Huxley, Sir George Gabriel Stokes, and William Spottiswoode, then president of the Society. Stokes was convinced the phenomenon Hughes was demonstrating was merely electromagnetic induction, and was it was incorrectly dismissed as not a type of conduction through the air. Hughes was not a physicist and seems to have accepted Stokes observations and did not pursue the experiments any further. While Hughes was continuing his wireless telegraphy research, Hertz's papers were published, and then he thought it was too late to bring forward these earlier experiments. Hughes' work was not published until it may have been mentioned in William Crookes 1892 Fortnightly Review on 'Some possibilities of electricity' article as an unnamed individual whose experiment Crookes participate in, and a full magazine article was written about it in 1899. A book about it was published in 1899 and 1901. However, his work was not done in obscurity. His substantial contributions to science achieved wide recognition during his lifetime, from his peers within the scientific community. Despite the initial erroneous dismissal of his radio system, he was elected a Fellow of the Royal Society in June 1880, and won their Royal Medal in 1885. He became one of the most highly decorated inventors of his time. His many accolades made him known to radio pioneers who would refine his work in later years. Indeed, the Hughes Medal was created by the Royal Society of London in his honor, to be awarded to other scientists "in recognition of an original discovery in the physical sciences, particularly electricity and magnetism or their applications". A listing follows of Hughes Medal recipients honored for achievements directly applicable to the advancement of radio science and technology. Hughes "abundantly proved his claim to have been the first to transmit actual signals..." "Hughes's experiments of 1879 were virtually a discovery of Hertzian waves before Hertz, of the coherer before Branly, and of wireless telegraphy before Marconi and others. Notably, the radio receiver technology of David Edward Hughes surpassed the simplistic spark-gap device that would first be studied by later radio researchers. He discovered that his microphone design exhibited unusual properties in the presence of radio signals. He experimented with the discovery, and described his creation of both the device classically known as a "coherer", and an improved semiconductor carbon and steel point-contact rectifying diode, which he also called a "coherer". The point-contact diode version of the device is now known as a crystal radio detector, and was the key component of his sensitive crystal radio receiver. Point-contact diodes had been independently discovered by other scientists. They were later studied and described in detail by J.C. Bose, in his research on their use in radio receivers. John Ambrose Fleming earned a Hughes Medal after he improved the Hughes diode receiver component with his invention of a vacuum tube diode, which could be operated more reliably than the semiconductor technology of the time. Fleming's U.S. patent for the vacuum tube rectifier diode was invalidated due to the prior art of the other diode researchers who preceded him. Elihu Thomson recognized the Hughes claim to be the first to transmit radio. Hughes himself said "with characteristic modesty" that Hertz's experiments were "far more conclusive than mine", and that Marconi's "efforts at demonstration merit the success he has received...[and] the world will be right in placing his name on the highest pinnacle, in relation to aerial electric telegraphy". 1888: Heinrich Rudolf Hertz (1857-1894) produced, detected and measured radio waves for first time with a simple oscilator design. Between 1886 and 1888 Heinrich Rudolf Hertz studied Maxwell's theory and conducted experiments that validated it through more rigorous scientific techniques than Hughes had used. He engineered a method of detecting spark-gap radio waves by observing that another unpowered spark-gap, acting as an antenna, would absorb the radio energy and convert it back into an electric spark. Hertz published his results in a series of papers between 1887 and 1890, and again in complete book form in 1893. For the first time in the decade since the work of David E. Hughes, electromagnetic radio waves ("Hertzian waves") were intentionally and unequivocally proven to have been transmitted through free space by a Hughes spark-gap device, and detected over a short distance. Hertz was able to have some control over the frequencies of his radiated waves by altering the inductance and capacitance of his transmitting and receiving antennas. He focused the electromagnetic waves using a corner reflector and a parabolic reflector, to demonstrate that radio behaved the same as light, as Maxwell's electromagnetic theory had predicted more than 20 years earlier. He demonstrated that radio had all the properties of waves, and discovered that the electromagnetic equations could be reformulated into a partial differential equation called the wave equation. Hertz did not devise a system for practical utilization of radio, like Hughes did, nor did he describe any potential applications of the technology. He seemed uninterested in the useful importance of his experiments. When asked what the ramifications were for his work, Hertz replied, "Nothing, I guess." He also said, "I do not think that the wireless waves...will have any practical application." Hertz died in 1894, and the art of radio was left to others to implement into a practical form. After Hertz's experiments, Sir William Crookes published his thoughts on wireless technology for a wider audience, and Professor Amos Emerson Dolbear brought similar attention. The race toward a functioning, potentially profitable radio communication system had begun. 1890: Édouard Branly (1844-1940) invented a device, known as "coherer," that becomes conducting in the presence of natural electric disturbances, such as lightning. (Powdered metal particles that attract one another as a field induces minute currents in them). In 1890, Édouard Branly demonstrated what he later called the "radio-conductor," which Lodge in 1893 named the coherer, the first sensitive device for detecting radio waves. Shortly after the experiments of Hertz, Dr. Branly discovered that loose metal filings, which in a normal state have a high electrical resistance, lose this resistance in the presence of electric oscillations and become practically conductors of electricity. This Branly showed by placing metal filings in a glass box or tube, and making them part of an ordinary electric circuit. According to the common explanation, when electric waves are set up in the neighborhood of this circuit, electromotive forces are generated in it which appear to bring the filings more closely together, that is, to cohere, and thus their electrical resistance decreases, from which cause this piece of apparatus was termed by Sir Oliver Lodge a coherer. Hence the receiving instrument, which may be a telegraph relay, that normally would not indicate any sign of current from the small battery, can be operated when electric oscillations are set up. Prof. Branly further found that when the filings had once cohered they retained their low resistance until shaken apart, for instance, by tapping on the tube. The coherer, however, was not sensitive enough to be used reliably as radio developed. 1892: William Preece (1834-1913) detected current interruptions in one with the other using loops of wire several hundred feet long. He signaled between two points by a system which employed both induction and conduction. This resulted in the appointment of a royal commission to investigate the practicability of the use of his system for communication between lightships and shore. (England). 1892: William Crookes (1832-1919) published an article in the Fortnightly Review in which he definitely suggested the use of Herzian waves for wireless telegraphy and pointed out that the method of achieving that result was to be found in the use and improvement of then known means of generating electrical waves of any desired wave length, to be transmitted through the ether to a receiver, both sending and receiving instruments being attuned to a definite wave length. In a speech before the Royal Academy in England, Sir William Crookes commented upon electromagnetic waves: "Here is unfolded to us a new and astonishing world, one which is hard to conceive should contain no possibilities of transmitting and receiving intelligence." 1893: Nikola Tesla (1856-1943) in 1893 in St. Louis he demonstrated the radiocomunication. In February 1893, addressing the Franklin Institute in Philadelphia, Pennsylvania, and March, 1893 at the National Electric Light Association, he described and demonstrated in detail these principles in his lecture "On Light and Other High Frequency Phenomena"
In 1890 patented an alternator that produced radio high-frequency current of around 10,000 hertz. Tesla suppressed the disagreeable sound of power-frequency harmonics produced by arc lamps operating on frequencies within the range of human hearing. The produced pulsations were in the longwave broadcasting range (LF) and very low frequency band (VLF). In 1891 was granted Patent US454,622 - System of Electric Lighting - June 23, 1891 patented a high-frequency coupled oscillator circuit with an air-cored transformer (early disruptive "Tesla" coil) which converts low-frequency currents into "current of very high frequency and very high potential", which then supplies single-terminal lamps. This coil was designed to produce a current of very high potential and very high frequency. During the same year, while experimenting with high-frequency currents, he discovered the principle of the rotary magnetic field and applied it to the induction motor. 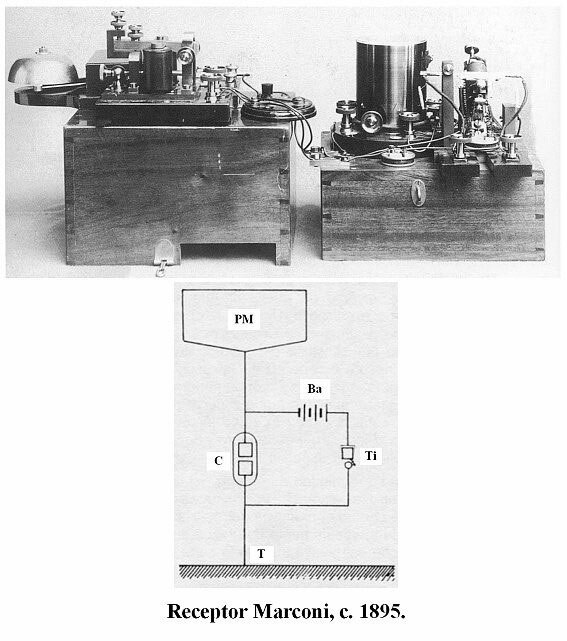 The First "Beat" Receptor for Radio-Telegraphy invented by Tesla, Which Foreshadowed the "Heterodyne." Tesla used similar types of devices since 1892. He improved the instrument on the photograph at the east of Houston Street Laboratory. One form of Nikola Tesla's Spark-gap transmitter. Source: H. S. Norrie, "Induction coils: how to make, use, and repair them". Norman H. Schneider, 1907, 4th edition, New York. In 1891 Nikola Tesla began his research into radio. Around July 1891 he developed various alternator apparatus that produced 15,000 cycles per second. In 1892 he delivered a lecture called "Experiments with Alternate Currents of High Potential and High Frequency" before the Institution of Electrical Engineers of London, in which he suggested that messages could be transmitted without wires. He repeated this presentation at the Royal Institution and at the Société Française de Physique in Paris. Tesla realized he gained, by the use of very high frequencies, many advantages in his experiments, such as the possibilities of working with one lead and of doing away with the leading-in wire. In transmitting impulses through conductors, he dealt with high pressure and high flow, in the ordinary interpretation of these terms. Towards the end of the lecture, he proposed that sending over the wire current vibrations of very high frequencies at enormous distance without affecting greatly the character of the vibrations and that telephony could be rendered practicable across the Atlantic. He also proposed transmission through the Earth. Tesla captured the attention of the whole scientific world by his fascinating experiments on high frequency electric currents. The induction coil transformer or source of electromotive force. The discharger or spark balls. The adjustable inductance for varying the period. The controller or key in the primary circuit of the coil or transformer. These several elements have each to be considered separately with reference to their best practical forms for various purposes. When the key is closed, and the apparatus in operation, there are trains of intermittent electrical oscillations set up in the circuit, and if the terminals of the secondary circuit of the oscillation transformer are near together, there is high potential high frequency oscillatory sparks passing between them. The above-described apparatus in a typical form is generally called a Tesla apparatus for the production of high frequency electric currents. Neighboring points on the Earth's surface. In 1893, at St. Louis, Missouri, Tesla gave a public demonstration, "On Light and Other High Frequency Phenomena", of wireless communication. Addressing the Franklin Institute in Philadelphia, he described in detail the principles of early radio communication. The lecture apparatus that Tesla used contained all the elements that were incorporated into radio systems before the development of the "oscillation valve", the early vacuum tube. The lecture delivered before the Franklin Institute, at Philadelphia, occurred on February 24, 1893. The variety of Tesla's radio frequency systems were again demonstrated during when he presented to meetings of the National Electric Light Association, at St. Louis, on March I, 1893. The high-frequency phenomena which Tesla first developed and displayed had scientific rather than practical interest; but Tesla called attention to the fact that by taking the Tesla oscillator, grounding one side of it and connecting the other to an insulated body of large surface, it should be possible to transmit electric oscillations to a great distance, and to communicate intelligence in this way to other oscillators in sympathetic resonance therewith. This was going far toward the invention of radio-telegraphy as known in the early 20th century, as stated by the Electrical World in 1917. In 1894, T. C. Martin published "The Inventions, Researches and Writings of Nikola Tesla", detailing the work of Tesla in the previous years. Various scientists, inventors, and experimenters began to investigate wireless methods. Tesla's work contained coupled oscillation circuits having capacity and inductance in series. In 1895 was producing signals by high-frequency alternators around New York from his laboratory in Fifth Avenue. By tuning several sources at slightly separated frequencies, he was able to monitor the transmission at an audible beat frequency. Transmission and radiation of radio frequency energy was a feature exhibited in the experiments by Tesla which he proposed might be used for the telecommunication of information. The Tesla method was mentioned in New York in 1897. In Buffalo, New York, he referred to devised means for transmission of electromotive forces, much higher than practical with ordinary apparatus, and the transmission of power from station to station without the employment of any connecting wire. Tesla later, on April 6, 1897, explained his methods of the transformation of electrical energy by oscillatory condenser discharges in his lecture "The stream of Lenard and Roentgen and novel apparatus for their production". He demonstrated his subject by a fine array of improved apparatus, in which a few feet of wire were made as efficient as miles under old systems. Tesla continued to work with resonance, and his patent US568,178 - Method of Regulating Apparatus for Producing Currents of High Frequency - September 22, 1896 shows several ways of obtaining resonance in a high-frequency circuit. In 1897, Tesla applied for two key United States radio patents, US645,576 - System of Transmission of Electrical Energy - March 20, 1900 (Filed September 2, 1897) first radio system patent, and (later subdivided into) US649,621 - Apparatus for Transmission of Electrical Energy - May 15, 1900 (Filed September 2, 1897) for protection of his interests of the radio arts. Tesla also developed sensitive electromagnetic receivers, that were unlike the less responsive coherers later used by other early experimenters. Since then he was able to pick up a signal at West Point, 30 miles from his transmitter. Tesla coils are in general use to power everyone's radio transmitters through the early years of the twentieth century. Shortly thereafter, he began to develop wireless remote control devices. In 1898, he demonstrated a radio controlled boat in Madison Square Garden that allowed secure communication between transmitter and receiver (the art of "telautomautomatics"). Between 1895 and 1897, Tesla received wireless signals transmitted via short distances in his lectures. Between 1897 and the first decade of the 1900s, he transmitted over medium ranges. Tesla had predicted that not only would intelligible signals be transmitted over long distances without wires, but electric power as well. He later published articles, such as The True Wireless - Electrical Experimenter - May 1919, and The Transmission of Electric Energy Without Wires" - Electrical World and Engineer - March 5, 1904, concerning the World Wireless System research. High frequency generators for producing continuous waves. Rotary and series spark gaps. Mica condensers impregnated with wax under vacuum. Selective tuning by beat waves or heterodyning. Arcs for producing continuous waves. “Ticker” for receiving continuous waves. Before 1897 (the year Marconi received his first wireless patent in the United States), Tesla devised boats, cars, and other movable objects that could be maneuvered completely by radio waves. He demonstrated these widely in New York in 1898, and before the Commercial Club in Chicago in 1899. This work with what Tesla called “Telautomatics”, advanced later by John Hays Hammond, Jr. and others, was the beginning of the concept which has led to today’s guided missiles. Prof. Arthur Korn, who actually sent the first pictures by wireless, credits Tesla with some of his system. "apparatus installed under my patents on many war vessels which according to Secretary of Navy Josephus Daniels is "superior to any other"
1894: On June 1, Oliver Joseph Lodge (1851-1940) delivers a memorial lecture on Hertz where he demonstrates the optical properties of "Hertzian waves" (radio waves), including transmitting them over a short distance, using an improved version of Branly's filing tube, which Lodge has named the "coherer", as a detector. He also demonstrates controlling frequency by changing inductance and capacitance in his circuits. One of the first investigators to notice and measure stationary waves on wires produced by direct coupling (resonance) with the coatings of a Leyden jar was Sir Oliver Lodge on June 4, 1891, entitled "Experiments On The Discharge Of Leyden Jars". On June, 1, 1894, Oliver Lodge at the Royal Institution lectures, delivered "The Work of Hertz and Some of His Successors". Two years after Tesla's high potential and high frequency lecture and five years after Hertz's signals, Lodge performed transmission on August 14, 1894 sending a message of Morse code 150 feet on radio waves. The demonstration took place in the Oxford University Museum of Natural History. The signal was sent from the Clarendon laboratory building next door. Lodge did this at a meeting of the British Association for the Advancement of Science at Oxford University. This was a year before Marconi's initial experiments. Also in 1894, Lodge would state that Alexander Muirhead clearly foresaw the telegraphic importance of the transmission of transverse Hertzian waves. A convenient method of establishing stationary electric waves on wires is one which generally attribute to Ernst Lecher, and call the Lecher arrangement. As a matter of fact, it originated with Lodge and Hertz, whilst Edouard Sarasin and Lucien de la Rive gave it an improved form. On that day in August 1894, Lodge demonstrated the reception of Morse code signalling via radio waves using a "coherer". He later improved Branly's coherer by adding a "trembler" which dislodged clumped filings, thus restoring the device's sensitivity. In 16 August, 1898 he got the patent US609,154A - Electric Telegraphy, that made wireless signals using Ruhmkorff coils or Tesla coils for the transmitter and a Branly coherer for the detector. 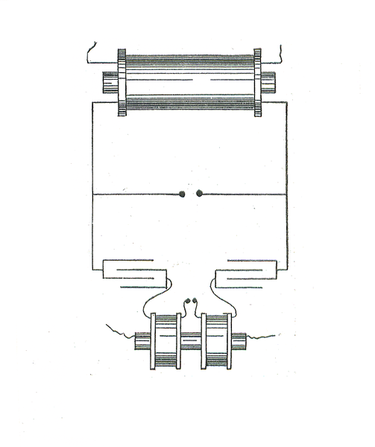 This patent was utilizing the concept of "syntonic" tuning. Many people in the Victorian era including Charles Dickens firmly believed in telepathy. Lodge thought that mind reading might be a form of communication through the ether, rather like radio waves. His adherence to spiritualism (explained below) would cause the estimation of his work by his scientific contemporaries to plummet spectacularly. Only recently has full credit has been given to his patent, which he called 'synchronicity' and which was purchased and plagiarized by Marconi who employed him as a consultant. In 1911 the Marconi Company lost a brief legal battle and was forced to purchase Lodge's syntonic tuner patent US609,154A - Electric Telegraphy - 16 August, 1898 and in 1912 Lodge sold the patent to Marconi. In this lecture, Lodge stated that in his estimate the apparatus used would respond to signals at a distance of .5 miles (0.80 km). In 1894 Lodge showed that the Branly coherer could be employed to transmit telegraphic signals, and in order that the filings should not remain "cohered" after the cessation of the electric oscillations, he devised an electro-mechanical "tapper" on the principle of the ordinary "buzzer," or electric door-bell, the hammer of which was caused to tap the glass tube as long as the electric oscillations continued. The filings thus virtually take the place of a key in the ordinary telegraph circuit. In the normal state the key is open; in the presence of electrical oscillations the key is closed. Thus, by opening and closing the key for a longer or shorter period, signals corresponding to dots and dashes may be produced. In other words, by setting up electric oscillations for periods of time corresponding to dots and dashes, messages may be transmitted from the sending station, and if, at the receiving station, a recording instrument (controlled by the coherer), such as the ordinary Morse register, be provided, a record of the message in dots and dashes may be obtained. Dr. Lodge in fact used a tapper operated continuously by clockwork. In 1894, with the help of the Branly filings tube, Lodge gave a couple of demonstrations, one in June at the Royal Institution at Oxford and one in August at Oxford, to the British Association, using Hertz oscillators for transmitting signals, using a Morse key in connection with the sending coil, and a Thomson marine galvanometer for receiving them—sending the signals from one room to another through walls, and so on. Lodge sent them also across the quadrangle of Liverpool College, but he applied very small power and did not try for big distances. At that time Dr. Alexander Muirhead was struck with its applicability to practical telegraphy, and when in 1896 Sir William Preece told the British Association meeting (as it happened in his laboratory) at Liverpool that an Italian gentleman (at that time unknown) was interesting the Post Office in a secret box, Lodge knew practically what the box must contain, and immediately afterwards (the same day) he showed to a few friends a Morse tape instrument, very roughly working on that plan. Mr. Marconi and Sir William Preece together interested the whole world in the subject; great power was applied to the sender, and the matter became of financial importance. However, the American Patent Office gave Lodge a telegraphic patent based on his work, as published in 1894, after proof that this book had reached America in or before 1895. When, in 1897, the English press began to write about Marconi, Lodge stated that nothing had been invented by the Italian scientist, because in 1894, one year prior to Marconi, he had already proved the possibility of wireless transmission over distance. In this debate Lodge was supported by a large part of the British physicists of the time. He repeated his claim several times and totally disagreed with the Post Office chief engineer, William Preece, whom he had already challenged on various occasions in the past. In 1911 the Marconi Company lost a brief legal battle and was forced to purchase Lodge's syntonic tuner. 1894: In November, the Indian physicist Jagadish Chandra Bose, building on Lodges published work, demonstrated publicly the use of radio waves in Calcutta, but he was not interested in patenting his work. Bose ignited gunpowder and rang a bell at a distance using electromagnetic waves proving that communication signals can be sent without using wires. He sent and received radio waves over distance but did not commercially exploit this achievement. The 1895 public demonstration by Bose in Calcutta was before Marconi's wireless signalling experiment on Salisbury Plain in England in May 1897. Bose demonstrated the ability of the electric rays to travel from the lecture room, and through an intervening room and passage, to a third room 75 feet (23 m) distant from the radiator, thus passing through three solid walls on the way, as well as the body of the chairman (who happened to be the Lieutenant-Governor). The receiver at this distance still had energy enough to make a contact which set a bell ringing, discharged a pistol, and exploded a miniature mine. To get this result from his small radiator, Bose set up an apparatus which curiously anticipated the lofty 'antennae' of modern wireless telegraphy— a circular metal plate at the top of a pole, 20 feet (6.1 m) high, being put in connection with the radiator and a similar one with the receiving apparatus. The form of 'Coherer' devised by Professor Bose, and described by him at the end of his paper 'On a new Electro Polariscope' allowed for the sensibility and range to appear to leave little to be desired at the time. In 1896, the Daily Chronicle of England reported on his UHF experiments: "The inventor (J.C. Bose) has transmitted signals to a distance of nearly a mile and herein lies the first and obvious and exceedingly valuable application of this new theoretical marvel." After Bose's Friday Evening Discourses at the Royal Institution, The Electric Engineer expressed 'surprise that no secret was at any time made as to its construction, so that it has been open to all the world to adopt it for practical and possibly money-making purposes.' Bose was sometimes, and not unnaturally, criticised as unpractical for making no profit from his inventions. In 1899, Bose announced the development of an "iron-mercury-iron coherer with telephone detector" in a paper presented at the Royal Society, London. Later he received U.S. Patent 755,840, "Detector for electrical disturbances" (1904), for a specific electromagnetic receiver. Bose would continue research and made other contributuions to the development of radio. 1895: Ernest Rutherford (1871-1937) was awarded an Exhibition of 1851 Science Research Scholarship to Cambridge. 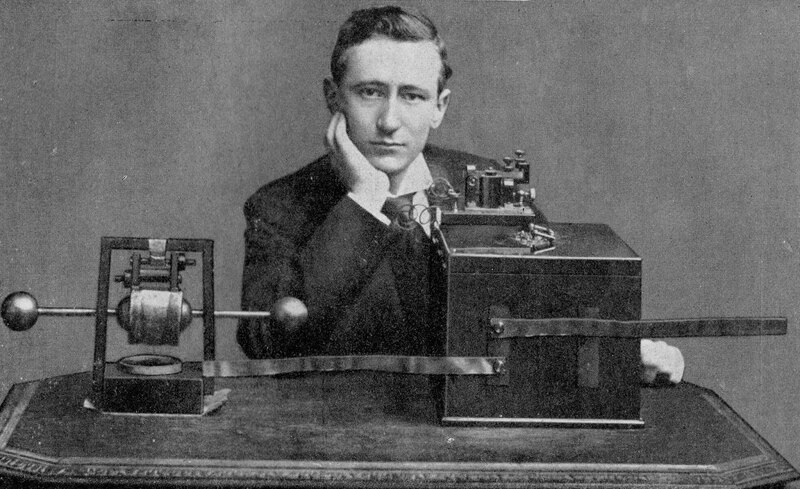 With Thomson's encouragement, he managed to detect radio waves at half a mile and briefly held the world record for the distance over which electromagnetic waves could be detected, though when he presented his results at the British Association meeting in 1896, he discovered he had been outdone by another lecturer, by the name of Marconi. The New Zealander, 1st Baron Rutherford of Nelson contributed to the development of radio. He arrived in England with a reputation as an innovator and inventor, and distinguished himself in several fields, initially by working out the electrical properties of solids and then using wireless waves as a method of signalling. Rutherford was encouraged in his work by Sir Robert Ball, who had been scientific adviser to the body maintaining lighthouses on the Irish coast; he wished to solve the difficult problem of a ship's inability to detect a lighthouse in fog. Sensing fame and fortune, Rutherford increased the sensitivity of his apparatus until he could detect electromagnetic waves via his electromagnetic receiver over a distance of several hundred meters. The hysteresis magnetic detector invented by Rutherford, and described by him in 1897, was used to determine the characteristics of electromagnetic waves, the ends of the little solenoid of the detector being attached to the mercury cups of the slider. The development, though, of wireless technology was left for others, as Rutherford continued purely scientific research. J. J. Thomson realized that Rutherford was a researcher of ability and invited him to join in a study of the electrical conduction of gases. 1896: Aleksandr Popov (1859-1906) transmited radio signals between buildings at the University of St. Petersburg and he presented his radio reciever to the Russian phisical and chemical society. During the Chicago World's Columbian Exhibition and the Third International Electrical Congress, Alexander Stepanovich Popov of Kronstadt, Russia was a representative of the Russian Torpedo School. Afterward, he worked on his wireless designs. Popov conducted experiments along the lines of Hertz's research. In 1894-95 he built his first radio receiver, an improved version of coherer-based design by Oliver Lodge. In 1895, he built a coherer. Popov constructed a filings coherer, one form of which was used in some surveying experiments by the Russian government. He used early in 1895, the coherer auto-tapping mechanism, and substituted for the galvanometer an ordinary telegraphic relay. He operated this apparatus at a distance by means of a large radiator. One terminal of his coherer was connected to a conductor fastened to a mast about 30 ft. high on the top of the Institute building and the other terminal of the coherer was grounded. 1896-1897: Guglielmo Marconi (1874-1937) is granted British patent GB12,039 - Improvements in Transmitting Electrical impulses and Signals, and in Apparatus therefor by Guglielmo Marconi - Accepted, 2nd July 1897. This Marconi patent is the first description in print of a wireless telegraphy device (US586193; RE11913). He established the Wireless Telegraph and Signal Company in 1897. By 1899 he sent a radio signal nine miles across the Bristol Channel. In 1901, after weeks of effort, he sends the letter "S" signal from England to Newfoundland, which represented the first transatlantic wireless communication. Guglielmo Marconi studied at the Leghorn Technical School, and acquainted himself with the published writings of Professor Augusto Righi of the University of Bologna. In 1894, Sir William Preece delivered a paper to the Royal Institution in London on electric signalling without wires. In 1894 at the Royal Institution lectures, Lodge delivers "The Work of Hertz and Some of His Successors". Marconi is said to have read, while on vacation in 1894, about the experiments that Hertz did in the 1880s. Marconi also read about Tesla's work. It was at this time that Marconi began to understand that radio waves could be used for wireless communications. Marconi's early apparatus was a development of Hertz’s laboratory apparatus into a system designed for communications purposes. At first Marconi used a transmitter to ring a bell in a receiver in his attic laboratory. He then moved his experiments out-of-doors on the family estate near Bologna, Italy, to communicate further. He replaced Hertz’s vertical dipole with a vertical wire topped by a metal sheet, with an opposing terminal connected to the ground. 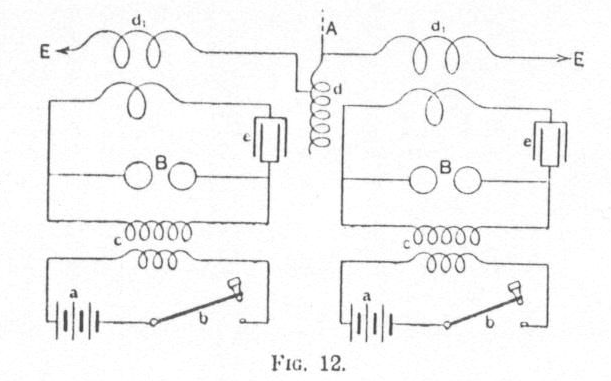 On the receiver side, Marconi replaced the spark gap with a metal powder coherer, a detector developed by Edouard Branly and other experimenters. Marconi transmitted radio signals for about 1.5 miles (2.4 km) at the end of 1895. By 1896, Marconi introduced to the public a device in London, asserting it was his invention. Despite Marconi's statements to the contrary, though, the apparatus resembles Tesla's descriptions in his research, demonstrations and patents. Marconi's later practical four-tuned system was pre-dated by N. Tesla, Oliver Lodge, and J. S. Stone. He filed a patent on his earliest system with the British Patent Office on June 2, 1896. Marconi was far from beeing a mathematician, a physicist or an engineer. However he was intuitive enough to organize, promote and construct the system for wireless emission and reception of signals. He utilized all the possible human and material resources that he had in his disposal. John Ambrose Fleming contributed in great part in his project. Richard Norman Vyvyan and W.H. Eccles helped to improve the Marconi's jigger design. Luigi Solari contributed to the project with the mercury cohesor which was their most sensitive detector of electromagnetic signals. Marconi himself designed the antenna and tuning system however the antenna was built by George Kemp. WS Entwistle perfected the spark-gap system and has operated machinery transmission from Poldhu. Marconi, George Kemp and Paget Percy Wright operated together in St. John, despite the atrocious weather in Newfoundland. The success of the experiment was the result of collaboration of a team, and nothing would have been possible by the only effort of Marconi as promoter, organizer and builder of the system. In July, 1896, Marconi got his invention and new method of telegraphy to the attention of Preece, then engineer-in-chief to the British Government Telegraph Service, who had for the previous twelve years interested himself in the development of wireless telegraphy by the inductive-conductive method. 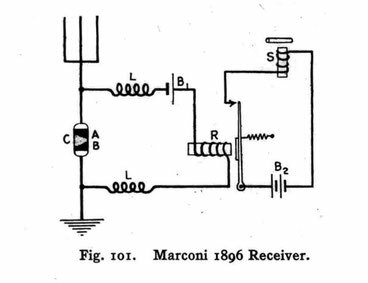 Marconi was awarded a patent for radio with British patent GB12,039 - Improvements in Transmitting Electrical impulses and Signals, and in Apparatus therefor - Accepted, 2nd July 1897. The complete specification was filed March 2, 1897. 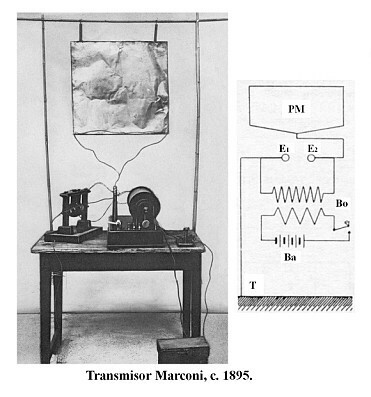 This was Marconi's initial patent for the radio, though it used various earlier techniques of various other experimenters (primarily Tesla) and resembled the instrument demonstrated by others (including Popov). 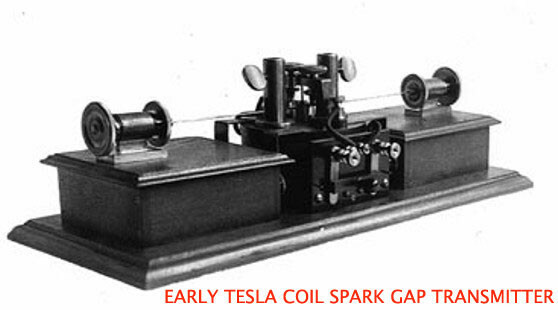 During this time spark-gap wireless telegraphy was widely researched. In the spring of 1897 Marconi was working for the Post Office experimenting with his invention over increasing distances of five, ten and fifteen kilometres in the Bristol channel. His scientific discovery had been unveiled to the public several months before, but nobody had the slightest idea of how it worked. In 1896, Bose went to London on a lecture tour and met Marconi, who was conducting wireless experiments for the British post office. The Marconi Company Ltd. was founded by Marconi in 1897, known as the Wireless Telegraph Trading Signal Company. Also in 1897, Marconi established the radio station at Niton, Isle of Wight, England. Marconi's wireless telegraphy was inspected by the Post Office Telegraph authorities; they made a series of experiments with Marconi's system of telegraphy without connecting wires, in the Bristol Channel. The October wireless signals of 1897 were sent from Salisbury Plain to Bath, a distance of 34 miles (55 km). 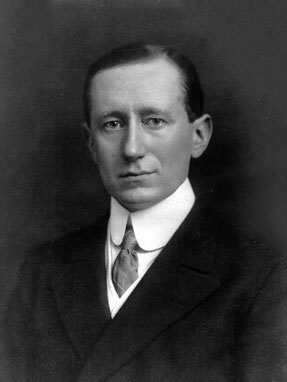 Marconi's reputation is largely based on the making of his law (1897), and other accomplishments in radio communications and commercializing a practical system. In May, 1898, communication was established for the Corporation of Lloyds between Ballycastle and the Lighthouse on Rathlin Island in the North of Ireland. In July, 1898, the Marconi telegraphy was employed to report the results of yacht races at the Kingston Regatta for the Dublin Express newspaper. A set of instruments were fitted up in a room at Kingstown, and another on board a steamer, the Flying Huntress. The aerial conductor on shore was a strip of wire netting attached to a mast 40 feet (12 m) high, and several hundred messages were sent and correctly received during the progress of the races. At this time His Majesty King Edward VII, then Prince of Wales, had the misfortune to injure his knee, and was confined on board the royal yacht Osltorm in Cowes Bay. Marconi fitted up his apparatus on board the royal yacht by request, and also at Osborne House, Isle of Wight, and kept up wireless communication for three weeks between these stations. The distances covered were small; but as the yacht moved about, on some occasions high hills were interposed, so that the aerial wires were overtopped by hundreds of feet, yet this was no obstacle to communication. These demonstrations led the Corporation of Trinity House to afford an opportunity for testing the system in practice between the South Foreland Lighthouse, near Dover, and the East Goodwin Lightship, on the Goodwin Sands. This installation was set in operation on December 24, 1898, and proved to be of value. It was shown that when once the apparatus was set up it could be worked by ordinary seamen with very little training. Transmission worked as well by night as by day, and in bad weather, fogs, or storms, as well as in fair weather; provided that the proper insulation of the aerial wire or elevated conductor was maintained. In certain electrical conditions of the atmosphere, and during thunderstorms, some difficulty was usually found in working, owing to the atmospheric discharges affecting the sensitive tube, and therefore making stray marks on the Morse tape of the printer, but seldom sufficient to interrupt communication altogether. The interposition of high hills, trees, or the curvature of the earth did not prevent communication, though slightly affecting the power required. It worked particularly well over sea surface, and between ships and shore stations. The apparatus could be set up and handled by any ordinary telegraphist, and the record was made on paper strip in the usual Morse code. Transmission easily covered distances far beyond those feasible or attained by other systems of wireless telegraphy. Lastly, the apparatus required was by no means costly, and, with the exception of the mast required for upholding the aerial wire, it occupied but little space, and was particularly adapted for use on board ship. The Haven Hotel station and Wireless Telegraph Mast was where much of Marconi's research work on wireless telegraphy was carried out after 1898. In 1899, he transmitted messages across the English Channel. The Emperor Wilhelm II sent a German engineer, Adolf Karl Heinrich Slaby (1849-1913), to witness one of Marconi's experiments. Inspired by Guglielmo Marconi’s electromagnetic-wave experiments, he introduced resonant coils, known as Slaby rods, for the measurement of wavelengths. In collaboration with Georg von Arco and Marconi, he helped develop wireless telegraphy in England. Slaby subsequently proposed the Slaby–Arco system—a modification of Marconi’s antenna that, with the Braun and Siemens–Halske systems, was adopted by the German wireless system established in 1903 (US750496A - Spark Telegraphy - 26 Gen. 1904 - Filed 9 Abr. 1901). Also in 1899, Marconi delivered "Wireless Telegraphy" to the Institution of Electrical Engineers. In addition, in 1899, W. H. Preece delivers "Aetheric Telegraphy", stating that the experimental stage in wireless telegraphy had been passed in 1894 and inventors were then entering the commercial stage. Preece, continuing in the lecture, details the work of Marconi and other British inventors. In October, 1899, the progress of the yachts in the international race between the Columbia and Shamrock was successfully reported by aerial telegraphy, as many as 4,000 words having been (as is said) despatched from the two ship stations to the shore stations. Immediately afterward the apparatus was placed by request at the service of the United States Navy Board, and some highly interesting experiments followed under Marconi's personal supervision. The Marconi Company was renamed Marconi's Wireless Telegraph Company in 1900. In 1901, Marconi claimed to have received daytime transatlantic radio frequency signals at a wavelength of 366 metres (820 kHz). Marconi established a wireless transmitting station at Marconi House, Rosslare Strand, Co. Wexford in 1901 to act as a link between Poldhu in Cornwall and Clifden in Co. Galway. His announcement on 12 December 1901, using a 152.4-metre (500 ft) kite-supported antenna for reception, stated that the message was received at Signal Hill in St John's, Newfoundland (now part of Canada) via signals transmitted by the company's new high-power station at Poldhu, Cornwall. The message received had been prearranged and was known to Marconi, consisting of the Morse letter 'S' - three dots. Bradford has recently contested the reported success, however, based on theoretical work as well as a reenactment of the experiment. It is now well-known that long-distance transmission at a wavelength of 366 meters is not possible during the daytime, because the skywave is heavily absorbed by the ionosphere. It is possible that what was heard was only random atmospheric noise, which was mistaken for a signal, or that Marconi may have heard a shortwave harmonic of the signal. The distance between the two points was about 3,500 kilometres (2,200 mi). In 1904, Marconi opened the ocean daily newspaper, the Cunard Daily Bulletin, on the R.M.S. "Campania." At the start, the passing events were printed in a little pamphlet of four pages called the Cunard Bulletin. The title would read Cunard Daily Bulletin, with subheads for "Marconigrams Direct to the Ship." 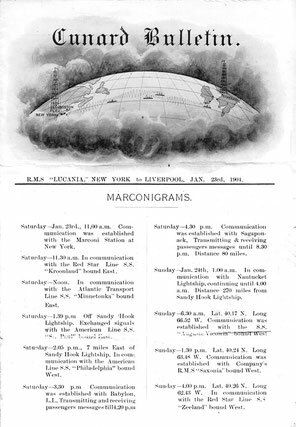 All the passenger ships of the Cunard Company are fitted with Marconi's system of wireless telegraphy, by means of which constant communication was kept up, either with other ships or with land stations on the eastern or western hemisphere. The RMS Lucania, Oct., 1903, with Marconi on board, was the first vessel to hold communication with both sides of the Atlantic. The Cunard Daily Bulletin, a thirty-two page illustrated paper published on board these boats, recorded news received by wireless telegraphy, and is first ocean newspaper. In August, 1903, in agreement was made with the British Government by which the Cunard Co. were to build two steamers, to be, with all other Cunard ships, at the disposal of the British Admiralty for hire or purchase whenever they may be required, the Government lending the company £2,600,000 to build the ships and granting them a subsidy £150,000 a year. One was the RMS Lusitania and the RMS Mauritania. Marconi’s patent US763772, granted in June 1904, was considered as the fundamental American radio patent but in 1943, the US Supreme Court cancelled it, on the grounds that it contained nothing not already in patents granted to Tesla (and Lodge and Stone). In June and July 1923, Marconi's shortwave transmissions were completed during nights on 97 meters from Poldhu Wireless Station, Cornwall, to his yacht Elettra in the Cape Verde Islands. In September 1924, Marconi transmitted during daytime and nighttime on 32 meters from Poldhu to his yacht in Beirut. Marconi, in July 1924, entered into contracts with the British General Post Office (GPO) to install telegraphy circuits from London to Australia, India, South Africa and Canada as the main element of the Imperial Wireless Chain. The UK-to-Canada shortwave "Beam Wireless Service" went into commercial operation on 25 October 1926. Beam Wireless Services from the UK to Australia, South Africa and India went into service in 1927. Electronic components for the system were built at Marconi's New Street wireless factory in Chelmsford. Marconi would jointly receive the 1909 Nobel Prize in Physics with Karl Ferdinand Braun for contributions to the existing radio sciences. Marconi's demonstrations of the use of radio for wireless communications, equipping ships with life saving wireless communications, establishing the first transatlantic radio service, and building the first stations for the British short wave service, have marked his place in history. Shortly after the turn of the 20th century, the US Patent Office re-awarded Marconi a patent for radio. The U.S. Patent RE11,913 was granted on June 4, 1901. Marconi's U.S. Patent 676,332 was awarded on June 11, 1901, also. This system was more advanced than his previous works. The United States Supreme Court, decision of MARCONI WIRELESS T. CO. OF AMERICA v. U.S., 320 U.S. 1 (1943) stated that “Marconi's reputation as the man who first achieved successful radio transmission … is not here in question” this statement is followed by “Marconi's patent involved no invention over Lodge, Tesla, and Stone”. The 1943 decision didn't overturn Marconi's original patents, or his reputation as the first person to develop practical radiotelegraphic communication. It just said that the adoption of adjustable transformers in the transmitting and receiving circuits, which was an improvement of the initial invention, was anticipated by patents issued to Oliver Lodge and John Stone. (This decision wasn't unanimous). The United States Navy Board had issued a 1899 report on the results of investigations of the Marconi system of wireless telegraphy. The report, Notes On The Marconi Wireless Telegraphy was published in full in the Electrician, and from it the following statements concerning the efficiency of the system have been taken: It was well adapted for use in squadron signalling under conditions of rain, fog, darkness and motion of speed. Wind, rain, fog, and other conditions of weather do not affect the transmission through space, but dampness may reduce the range, rapidity, and accuracy by impairing the insulation of the aerial wire and the instruments. Darkness has no effect. When two transmitters are sending at the same time, all the receiving wires within range receive the impulses from transmitters, and the tapes, although unreadable, show unmistakably that such double sending was taking place. In every case, under a great number of varied conditions, the attempted interference was complete. Marconi, although he stated to the Board before these attempts were made that he could prevent interference, never explained how nor made any attempt to demonstrate that it could be done. Between large ships heights of masts 130 feet (40 m) and 140 feet (43 m) and a torpedo-boat (height of mast 45 feet (14 m), across open water, signals can be read up to 7 miles (11 km) on the torpedo-boat and 85 miles (137 km) on the ship. Communication might be interrupted altogether when tall buildings of iron framing intervene. The rapidity was not greater than twelve words per minute for skilled operators. The sending apparatus and wire would injuriously affect the compass if placed near it. The exact distance were not known, and would be determined by experiment. The system was adapted for use on all vessels of the navy, including torpedo-boats and small vessels, as patrol boats, scout boats, and despatch boats, but it was impracticable in a small boat. For landing parties the only feasible method of use would be to erect a pole on shore and then communicate with the ship. The system could be adapted to the telegraphic determination of differences of longitude in surveying. The Board respectfully recommended that the system be given a trial in the United States Navy. The HMS Hector became the first British warship to have wireless telegraphy installed when she conducted the first trials of the new equipment for the Royal Navy. Starting in December 1899, the HMS Hector and HMS Jaseur were outfitted with wireless equipment. In 1901, HMS Jaseur received signals from the Marconi transmitter on the Isle of Wight and from the HMS Hector (25 January). 1899: Ferdinand Braun (1850-1918) contributed with Marconi's project with his "sparkless" antenna, and in 1909 shared the Nobel Prize for Physics with Marconi. 1899: In May–June, Julio Cervera Baviera (1854-1927) worked to develop his own system. After visiting Marconi’s radiotelegraphic installations on the English Channel, he began collaborating with Marconi on resolving the problem of a wireless communication system, obtaining some patents by the end of 1899. Cervera, who worked with Marconi and his assistant, George S. Kemp, in 1899, resolved the issues with their wireless telegraph. He obtained his first patents prior to the end of that year. 1900: On February 8, John Stone Stone (1869-1943) applied for a U.S. patent on a radio tuning device. Those concerned with proposed methods for the achievement of syntonic telegraphy, or the isolation of receiving stations or protection of receivers from the action of vagrant waves. Those describing forms of electric wave detector or cymoscope. Those covering the construction of various forms of transmitting and receiving circuit, and the production of continuous trains of waves. Miscellaneous specifications covering devices proposed for localizing the direction of the arriving waves and other matters. Stone has had issued a large number of patents embracing a method for impressing oscillations on a radiator system and emitting the energy in the form of waves of predetermined length whatever may be the electrical dimensions of the oscillator. 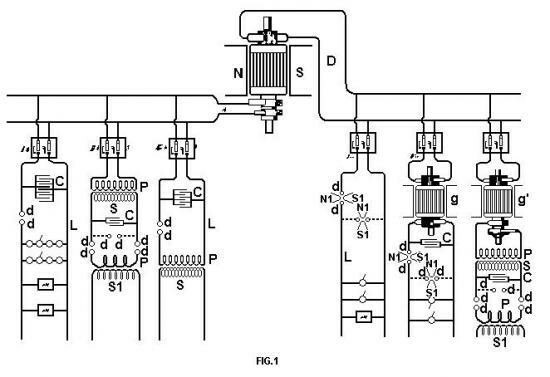 On February 8, 1900, he filed for a selective system in patent US714,756A - Method of selective electric signaling - 2 Des. 1902. In this system, two simple circuits are associated inductively, each having an independent degree of freedom, and in which the restoration of electric oscillations to zero potential the currents are superimposed, giving rise to compound harmonic currents which permit the resonator system to be syntonized with precision to the oscillator. Stone's system, as stated in patent US714,831 - Method of selective electric signaling - 2 Dec, 1902, developed free or unguided simple harmonic electromagnetic signal waves of a definite frequency to the exclusion of the energy of signal waves of other frequencies, and an elevated conductor and means for developing therein forced simple electric vibrations of corresponding frequency. In these patents Stone devised a multiple inductive oscillation circuit with the object of forcing on the antenna circuit a single oscillation of definite frequency. In the system for receiving the energy of free or unguided simple harmonic electromagnetic signal waves of a definite frequency to the exclusion of the energy of signal waves of other frequencies, he claimed an elevated conductor and a resonant circuit associated with said conductor and attuned to the frequency of the waves, the energy of which is to be received. A coherer made on what is called the Stone system was employed in some of the portable wireless outfits of the United States Army. The Stone Coherer has two small steel plugs between which are placed loosely packed carbon granules. This is a self-decohering device; though not as sensitive as other forms of detectors it is well suited to the rough usage of portable outfits. 1900: On June 3, Roberto Landell de Moura (1861-1928) publicly demonstrated a radio broadcast of the human voice. Roberto Landell de Moura, a Brazilian priest and scientist, went to Rome in 1878 and studied at the South American College and Pontifical Gregorian University, where he studied physics and chemistry. He completed his clerical training in Rome, graduating in theology, and was ordained a priest in 1886. In Rome, he began studying physics and electricity. When he returned to Brazil, he conducted experiments in wireless in Campinas and São Paulo (1892–1893). According to the newspaper Jornal do Comercio (June 10, 1900), he conducted his first public experiment on June 3, 1900, in front of journalists and the General Consul of Great Britain, Mr. C.P. Lupton, in the City of São Paulo, Brazil, reaching a distance of approximately 8 km. The points of transmission and reception were the Alto de Santana and Paulista Avenue in the downtown sector. One year after the above experiment in public, he received his first patent from the Brazilian government. It was described as "equipment for the purpose of phonetic transmissions through space, land and water elements at a distance with or without the use of wires". Upon observing the experiments, Rodriguez Botet, giving news of the trials, said he was not far from the moment of the consecration of Landell as an author of radio discoveries. Wireless telephony is reputed the most important discovery of Landell. De Moura did later pursue and receive several patents on wireless technology. Four months later, conscious that his invention had real value, he left Brazil for the United States of America with the intent of patenting the machine at the U S Patent Office in Washington, DC. With scarce resources he had to rely on friends to push ahead his project. In spite of great difficulties, three patents were finally awarded: "The Wave Transmitter" (October 11, 1904) which is the precursor of today's radio transceiver; "The Wireless Telephone" and the "Wireless Telegraph", both dated November 22, 1904. 1900: On 23 December, Reginald A. Fessenden (1866-1932) became the first person to send audio (wireless telephony) by means of electromagnetic waves, successfully transmitting over a distance of about 1.6 kilometers, and six years later on Christmas Eve 1906 he became the first person to make a public radio broadcast. In 1902 Reginald Fessenden (1866-1932) conceived the concept of "heterodyning" to simplify and improve radio receivers, but the principle wasn't practical until De Forest's invention of the triode. (Two radio frequencies are beat together to give a single "intermediate" frequency.) He is first to broadcast speech and music was in 1906. On January 1906 Fessenden developed a rotary-spark transmitter and first two-way transatlantic transmission. Using his rotary-spark transmitters, Fessenden made the first successful two-way transatlantic transmission, exchanging Morse code messages between the station at Brant Rock and an identical one built at Machrihanish in Scotland. (Note that Marconi had only achieved one-way transmissions at this time.) However, the transmitters could not bridge this distance during daylight hours or in the summer, so work was suspended until later in the year. Unfortunately, the Machrihanish radio tower collapsed, abruptly ending the transatlantic work. On December 21, 1906 he developed the alternator-transmitter used for wireless telephony. Fessenden gives a major demonstration of his new high frequency alternator-transmitter at Brant Rock, showing its utility for point-to-point wireless telephony, by interconnecting his stations (at Plymouth and Brant Rock) to the Bell telephone network. Prominent experts, Elihu Thompson and Greenleaf Pickard, together with others, witnessed the event. Refer to an article entitled “Experiments and Results in Wireless Telephony” published in The American Telephone Journal. On January 26, 1907. Three days before Christmas Eve (Helen Fessenden’s book, p. 153). Reginald Fessenden plans to give two radio broadcasts, on Christmas Eve and New Year’s Eve. Station staff notifies the ships of the US Navy and of the United Fruit Company to listen. These ships had previously been fitted with radio receivers. On 24 December 1906, the first radio broadcast for entertainment and music was transmitted from Brant Rock, Massachusetts to the general public. This pioneering broadcast was achieved after years of development work by Reginald Aubrey Fessenden (1866-1932) who built a complete system of wireless transmission and reception using amplitude modulation (AM) of continuous electromagnetic waves. This technology was a revolutionary departure from transmission of dots and dashes widespread at the time. The plaque may be viewed at the antenna base at Blackman's Point, 2 Central Street, Brant Rock, Massachusetts. Alternator-transmitter and the first radio broadcast. Landmark broadcast of transmission of ordinary speech and music from Brant Rock to ships sailing along the Atlantic coast. A repeat broadcast performance was given on New Years Eve. Reception is confirmed by the listeners. The historical site is located at Blackman’s Point, Brant Rock, in the County of Plymouth Massachusetts. Blackman’s Point is a few miles from the center of Marshfield. The Town of Marshfield is approximately 30 miles south-east of Boston. The remaining concrete foundation built to support Fessenden’s wireless tower, is in a trailer park owned by the Blackman family at the south end of the town of Brant Rock, off of Central St.
1904: British engineer Sir John Ambrose Fleming (1849-1945) invents the two-electrode radio rectifier (the "diode detector" or vacuum diode) which he calls an oscillation valve. Based on Edison's lightbulbs, the valve reliably detects radio waves and it is considered as the first vacuum-tube. 1906: Lee De Forest (1873-1961) invented the three-element vacuum tube, known as triode, for a better processing and amplification of the signal. He called this concept an "audion." Transcontinental telephone service becomes possible with Lee De Forest's 1907 patent of the triode, or three-element vacuum tube, which electronically amplifies signals. The development of radio has been possible by the observation of different phenomena implied in the transmission of electromagnetic waves. By other hand the technology has to be designed with the objective of controlling and getting some kind of profit of such phenomena. In this sense it could be considered that there exist some differences between the terms "the invention of radio" and "the discovery of radio phenomena". The discovery of radio as a phenomena could be related to the terms concerning theory/investigation/demonstration and the invention of radio could be related to the commercial, patents and practical application. For this reason it should be considered that the invention of radio it shouldn't be attributed to only one individual, knowing that without the first discoveries the invention could not exist. The invention of radio, as we know it today, has been possible by the efforts of many different discoverers and inventors, but in many cases it appears the controversy of who were the original discoverers to make possible the invention and aplication of it. Some of those names are: Guglielmo Marconi, Nikola Tesla, Alexander Popov, Sir Oliver Lodge, Reginald Fessenden, Heinrich Hertz, John Stone Stone, Amos Dolbear, Mahlon Loomis, Nathan Stubblefield and James Clerk Maxwell. "This apparatus I used in my laboratory demonstrations in two laboratories before and I had used it in the Colorado experiments where I erected a wireless plant in 1899. That apparatus was precious because it could flash a message across the Atlantic and yet it was built in 1894 or 1895. That is a very complicated and expensive apparatus". "When we raise the voice and hear an echo in reply, we know that the sound of the voice must have reached a distant wall, or boundary, and must have been reflected from the same. Exactly as the sound, so an electrical wave is reflected, and the same evidence which is afforded by an echo is offered by an electrical phenomenon known as a "stationary" wave—that is, a wave with fixed nodal and ventral regions. Instead of sending sound-vibrations toward a distant wall, I have sent electrical vibrations toward the remote boundaries of the earth, and instead of the wall the earth has replied. In place of an echo I have obtained a stationary electrical wave, a wave reflected from afar". "I misunderstood Tesla. I think we all misunderstood Tesla. We thought he was a dreamer and visionary. He did dream and his dreams came true, he did have visions but they were of a real future, not an imaginary one. Tesla was the first man to lift his eyes high enough to see that the rarified stratum of atmosphere above our earth was destined to play an important role in the radio telegraphy of the future, a fact which had to obtrude itself on the attention of most of us before we saw it. But Tesla also perceived what many of us did not in those days, namely, the currents which flowed way from the base of the antenna over the surface of the earth and in the earth itself." "Tesla, with his almost preternatural insight into alternating current phenomenon that had enabled him some years before to revolutionize the art of electric power transmission through the invention of the rotary field motor, knew how to make resonance serve, not merely the role of a microscope to make visible the electric oscillations, as Hertz had done, but he made it serve the role of a stereopticon to render spectacular to large audiences the phenomena of electric oscillations and high frequency currents....He did more to excite interest and create an intelligent understanding of these phenomena in the years 1891–1893 than anyone else, and the more we learn about high frequency phenomena, resonance, and radiation today, the nearer we find ourselves approaching what we at one time were inclined, through a species of intellectual myopia, to regard as the fascinating but fantastical speculations of a man whom we are now compelled, in the light of modern experience and knowledge, to admit was a prophet. But Tesla was no mere lecturer and prophet. He saw to the fulfillment of his prophesies and it has been difficult to make any but unimportant improvements in the art of radio-telegraphy without traveling part of the way at least, along a trail blazed by this pioneer who, though eminently ingenious, practical, and successful in the apparatus he devised and constructed, was so far ahead of his time that the best of us then mistook him for a dreamer. I never came anywhere near having an appreciation of what Mr. Tesla had done in this art until a very late date". ''In 1892 Nikola Tesla captured the attention of the whole scientific world by his fascinating experiments on high frequency electric currents. He stimulated the scientific imagination of others as well as displayed his own, and created a widespread interest in his brilliant demonstrations. Amongst those who witnessed these things no one was more able to appreciate their inner meaning than Sir William Crookes". It is supposed that Guglielmo Marconi had to read about some of the most important discoveries of that times on the electromagnetic phenomena to keep himself up to date. The most important news on this subject was about the experiments that Hertz did during the 1880s while he was on vacation in 1894 and about Nikola Tesla's work in the just-published book Inventions, Researches and Writings of Nikola Tesla. It doesn't seems to be a coincidence that it was during the same period of time when Marconi began to understand that radio waves could be used to send messages wirelessly through long distances. 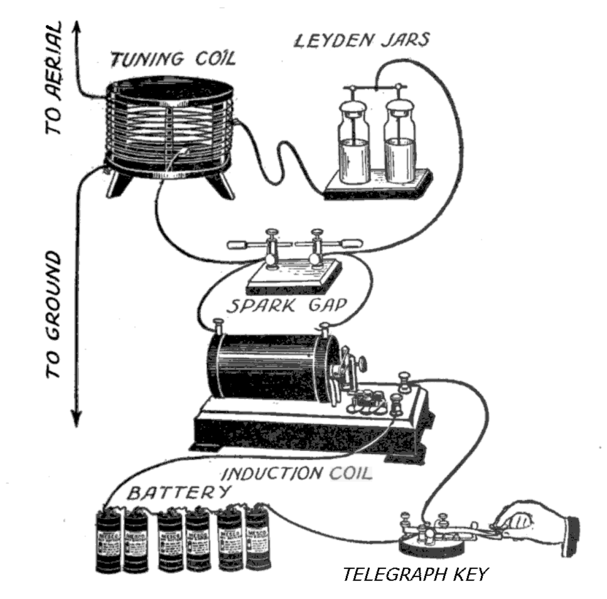 Leyden jar or condenser circuit in which is included the primary of what may be called Tesla coil, the secondary of which is connected to the earth or aerial conductor. The idea of using a Tesla coil to produce oscilations is not new. It was tried by the Post Office officials when experimenting with my system in 1898, and also suggested in a patent specification by Mr. Lodge, dated on May 10, 1897 No.11.575 and by Prof Braun in the specification of a patent dated on Ja. 26, 1899, No.1862. My idea was to asociate with this compound radiator a reciever tuned to the frequency of the oscilations set up in the vertical wire by the condenser circuit. When, in 1897, the English press began to write about Marconi, Lodge stated that nothing had been invented by the Italian scientist, because in 1894, one year prior to Marconi, he had already proved the possibility of wireless transmission over distance. In this debate Lodge was supported by a large part of the British physicists of the time. He repeated his claim several times and totally disagreed with the Post Office chief engineer, William Preece, whom he had already challenged on various occasions in the past. In 1911 the Marconi Company lost a brief legal battle and was forced to purchase Lodge's syntonic tuner patent US609,154A - Electric Telegraphy - 16 August, 1898. On November 10, 1900 Marconi requested his first patent in USA which was refused by claiming the use of Tesla's ideas, as happened for the next three years. "Many of the claims are not patentable over Tesla patent numbers 645,576 and 649,621, of record, the amendment to overcome said references as well as Marconi's pretended ignorance of the nature of a "Tesla oscillator" being little short of absurd... the term "Tesla oscillator" has become a household word on both continents (Europe and North America)". Suddenly, on June 28, 1904, the "US Patent Office" went against its previous decisions and gave Marconi US Patent 763,772 for a radio transmission system using tuned circuits. At that time it seems to have been the economic strength of his company and its prestige that influenced the decision. "This machine was simply to charge and discharge in rapid succession a body insulated in space, thus altering periodically the amount of electricity in the earth, and consequently the pressure all over its surface. It was nothing but what in mechanics is a pump, forcing water from a large reservoir into a small one and back again. Primarily I contemplated only the sending of messages to great distances in this manner, and I described the scheme in detail, pointing out on that occasion the importance of ascertaining certain electrical conditions of the earth. The attractive feature of this plan was that the intensity of the signals should diminish very little with the distance, and, in fact, should not diminish at all, if it were not for certain losses occurring, chiefly in the atmosphere. As all my previous ideas, this one, too, received the treatment of Marsyas, but it forms, nevertheless, the basis of what is now known as —wireless telegraphy.— This statement will bear rigorous examination, but it is not made with the intent of detracting from the merit of others. On the contrary, it is with great pleasure that I acknowledge the early work of Dr. Lodge, the brilliant experiments of Marconi, and of a later experimenter in this line, Dr. Slaby, of Berlin. Now, this idea I extended to a system of power transmission, and I submitted it to Helmholtz on the occasion of his visit to this country. He unhesitatingly said that power could certainly be transmitted in this manner, but he doubted that I could ever produce an apparatus capable of creating the high pressures of a number of million volts, which were required to attack the problem with any chance of success, and that I could overcome the difficulties of insulation". Nikola Tesla returned yesturday to New York from his plant on Long Island and was seen by Sun reporter in reference to Prof. Silvanus Thompson's statement that both Marconi and Slavy are indepted to Lodge for his discoveries in wireless telegraphy, rather than to anything that they have originated. "It is to be regretted that so many eminent men should engage in battle over this matter" Mr. Tesla said "especially when there is no necessity for it. All the facts in the case may easily be ascertained by going over the records". "In reference to Herzian telegraphy, I have been a disinterested overlooker, as I devoted my self to my own system. But I know in a general way that Lodge gave first descriptions of certain devices known as the coherer and the tapper, subsequently used by others. Lodge is a pioneer of great force, and I have myself frequently acknowledged my indebtedness to him in other lines of work". "Nevertheless, I consider that the published writings of Prof. Slaby on Herzian apparatus are deserving of the greatest credit, which every one should unhesitatingly accord to him as he was never failed to acknowledge duly the work of others". "I disagree with Prof. Thompson on the importance he assigns to the coherer and tapper, as I exhaustively tested this devices and proved them inadequate for carrying on practically quick telegraphy". "The coherer is an instrument of wonderfull sensitiveness, but there are other devices better suited to use in connection with tunned circuits in all cases in which reliability of action is an important factor". "Quite appart from that the Herzian circuits separated from the ground by spark gaps and choking coils, as used by Lodge and others, are for all pruposes inoperative, as they permit neither the transmission of effects at considerable distance from the source". The italian inventor claimed all the first patents for radio, and he didn't give any credit to Tesla's achievements. Anyway the patent was turned in Tesla's favor again in 1943 after authorities had proof from documents, but it was too late for Tesla to defend himself, after the noble inventor already gone away (on January of 1943). Once again, they were economic and monetary reasons, not technical reasons that led to this outcome. Marconi had demanded a payment to the United States, for the use of his patent during the 1st World War, which was considered an outrage and resulted in this retaliation. Tesla made the radio first, the rest was patent use. The Tesla coil, invented in 1891, is still used in radio and television sets and other electronic equipment. "Moreover, I have recently learned through the leading British electrical journal (Electrician, London, February 27, 1903), that some experimenters have abandoned all their own and have been "converted" to my methods and appliances, without my approval and officiation. I was both astonished and pained—astonished at the nonchalance and lack of appreciation of these men, pained at the inability exhibited in the construction and use of my apparatus. My high hopes raised by that excellent journal, however, are still to be realized, for I have ascertained that His Majesty the King of England, His excellency the President of the United States, and other persons of exalted positions have, after all, not conferred upon me the imperishable honor of graciously condescending to the use for my coils, transformers and high-potential methods of transmission, but have exchanged their august greetings through the medium of a cable in the old-fashioned way. What has been actually achieved by Hertzian telegraphy can only be conjectured". "A radio comunication system requires two tuned circuits each at transmitter and receiver, all four tuned to the same frequency. It does not include the variable modulation through whith voice and music can be transmitted. Nor does it adress to mode of electromagnetic propagation-that is ground wave and/or sky waves and their effects. It does however describe the deliberate, selective transmission of a specific frequency and the selectable receprtion and the same frequency". 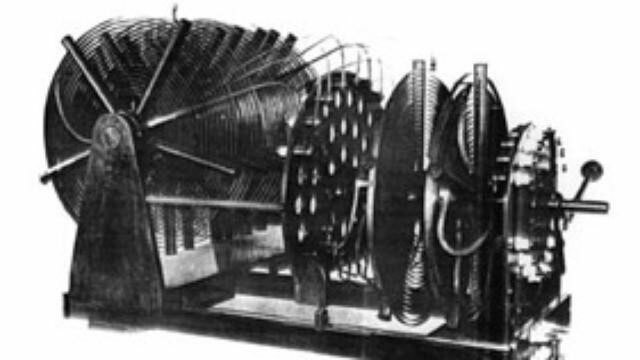 Tesla’s contributions to radio were associated with the idea of generating high-frequency continuous oscillations (in contrast to the transient spark-based methods of his contemporary innovators), and he succeeded in direct generation of 15kHz by a rotating electrical alternator – far higher than anything possible before that from a rotating machine. He developed the concept of two coupled resonant circuits driven by a spark generator (basically, the Tesla Coil – the first air-cored transformer), so producing an output which was a lightly-damped oscillation, approaching his objective of continuous high-frequency oscillations. By 1893, based on this system of coupled resonant circuits, he showed the need for an aerial and earth connection for radio telegraphy communications. In a public lecture in Philadelphia in February 1893 (On Light and Other High Frequency Phenomena - A lecture delivered before the Franklin Institute, Philadelphia, February 1893, and the National Electric Light Association, St. Louis, March, 1893), he is reported as having discussed the wireless transmission of both energy and signals carrying intelligence. His ambition was to achieve wireless methods of lighting and operating electrical motors over substantial distances. He hoped for high-power transmission by radio, which attracted him because, if feasible, this would have eliminated the need for cables to transmit electrical power. Although he suggested some techniques for this, and apparently believed that some kind of resonance could make this possible, his ideas were associated with doubts and controversy, and it seems likely that there was no realistic method for their success. He had no technique for generation of high power microwaves, which could have been transmitted in a focussed beam, and there does not seem to be any basis for supposing that the frequencies which he was able to generate could ever have been used in any point-to-point wireless power distribution system. However, there is some recent speculative work on very low frequency oscillations which does hint at possibilities of remarkable phenomena involving resonance of the Earth’s structure. Tesla predicted 6Hz as an oscillation frequency of the Earth, and recent measurements have reported 8Hz, remarkably close considering the limited knowledge available to Tesla. Tesla’s 1893 achievements were followed in 1894 with wireless transmission by Professor Oliver Lodge (12th June 1851 - 22nd August 1940) to a receiver with a dipole antenna and coherer that were carried out at Liverpool University in England. Popov’s demonstrations were in 1895, and Marconi’s arrival in England was 1896. There is thus a strong basis for claiming Tesla as a significant “inventor of radio”, and perhaps even the first. Marconi’s US patent 763772, granted in June 1904, was considered as the fundamental American radio patent, but in 1943, the US Supreme Court cancelled it, on the grounds that it contained nothing not already in patents granted to Tesla (and Lodge and Stone). "Tesla's ingenious invention of the polyphase system as well as his explorations of the amazing phenomenon of high frequency oscillations were the basis for developing completely new conditions for industry and radio communications, and had a profound influence upon the whole civilization." The best article i have ever seen, did you metion <a href="http://911electronic.com/rectifier-diode/">rectifier diode</a> in this? The outstanding historical overview to the hidden history of the inventors of radio! Da iawn! It is so rewarding to see an "icon of cymru" shine like an eternal star in the hall of fame of radio achievers: david edward hughes, son of corwen and icon of wales!! Why do you refer to Edison's 1891 patent as " based on the mutual-inductively coupled or magnetically coupled communication " yet Tesla's boat you call "Radio controlled "